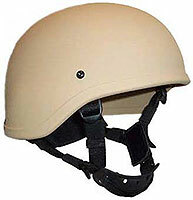 The Global Armour Ballistic Helmet is a low weight helmet designed to maximise the level of protection up to level IIIA. – Suspension systems standard 4 point chin strap harness, with integrated nape pad. – Crown mesh with cross straps with plastic chin cup. If you have any questions or wish to place an order, you can get in touch with us via the contact form, or call us on +44 (0)20 3239 5257.